It has been months in development, but we are very close to launching HVACTraining.TV. 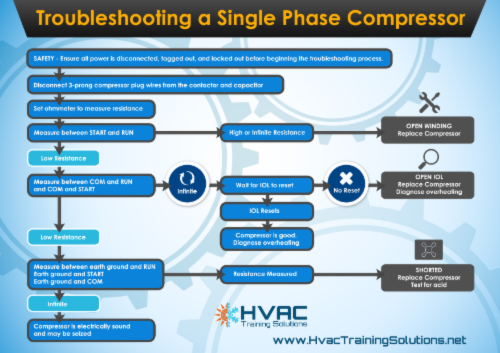 Throughout the years I have received many requests for stand alone online HVAC training that HVAC contractors can use for group training. While our online courses are designed to help standardize the training of your techs and provide a career path, it does not provide for group training, hence HVACTraining.TV. Stand alone training topics delivered every 3 weeks. Video format 15-20 minutes in length. Sets the stage for your training meeting and discussion. You do not need to come up with the topic or lead the training. You have lifetime access so your new hires can watch and catch up. 2 years of training topics (monthly). In addition, we also have a new HVAC Career Training program, designed to standardize your training company wide and to “grow your own” technician. It is an in house apprenticeship program. (More to follow). The videos are a combination of some of the best from our online HVAC Training and new, never seen before, videos. The online HVAC Training topics include – TXVs, the refrigeration cycle, ignition control modules, thermistors, symptoms of overcharged and undercharged systems, and much more. Because HVAC training is ongoing, new video topics are in the queue and ready for production. This is an ongoing and ever growing library of online HVAC training topics. Please feel free to call or message me if you have any questions, you can check it out here: HVACTraining.TV. After retiring from the U.S. Marines and achieving his B.S. degree, Ron Walker entered the HVAC field. He has been an HVAC technician, service manager, and business owner. Working as a service manager, he spent many years training HVAC technicians to be more technically competent and really understand their trade. His passion for teaching and helping others resulted in the creation of HVAC Training Solutions, LLC.